Zte still fails to compress the attachments when I opt to enable the attachment cloud service on the outlook toolbar. if I disable it the files compress & send fine. using the ‘shell’ options and the ‘cloud’ service appear to be functioning correctly. it’s only when using outlook 2010 that the problem arises. tried reboot and clean installations but still the problem persists. also confirming something ‘Richard’ touched on when replying to an email that previously had a zip attachment…if I try to reply and attach additional files to the email then Zte fails to compress them and sends the files in their original format. I suppose you were using Outlook 2010 64-bit? There was an error with OpenSSL on x64 and will be fixed in next release. are you sure additional files is not the filter? Does the compression options screen show up after you click send or? yes the compression screen does show up and I’m given the option to compress or not and then it goes through it’s normal procedure. yes Ivan I am using Outlook 2010 64-bit. surely this isn’t by design ? 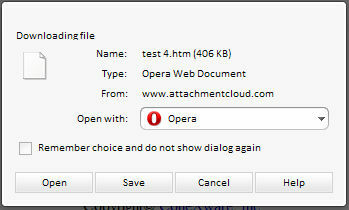 this is probably an ‘Opera’ issue but when I try to download the file I’ve uploaded to attachmentcloud I only get the option to download a *.htm file instead of the zip file. Are you using this release? so it still doesnt work in Outlook with AC? it will work but only if I’ve logged in manually at the site prior to me sending. … work meaning use of AC, otherwise it just compresses the file without usage of AC, right? if I haven’t logged into my AC account then outlook fails to zip and send to AC even though it briefly flashes up a progress bar…this happens when it’s a new message. if I’m trying to reply to someone using Zte with attachment it also fails and just sends the files in their natural form and not zipped. if I’m just sending files using Zte and not using AC then all seems fine unless I’m trying to reply to someone then it fails. Hehe, almost all browsers act in different way when it is file type, file name and other information send before download. We have fixed issues in IE 6,7,8,9, Firefox and Chrome, but there might be still some other browsers that detect based on different things. Please specify Opera version so I will install and check with that specific version. Thanks. Opera v11.62 Build 1340…thanks Ivan. The download issue has been fixed for Opera web browsers. Thanks! Thanks Ivan…are you referring to the ‘next’ release of Zte though? just tested again and now appears to be working fine but I will do additional tests to make sure. it’s now uploading to AC without any issues but I’ve made no changes here…I’m testing in the same manner as I’ve done all week. as soon as I cleared cookies and logged out of AC and then tried to send to AC via outlook it failed once again. I’ve got to be logged in to AC before outlook will successfully upload it. ivan was talking about Opera, not login… i dont know how login can work the way it works for you but i will check with ivan. clicking the download link in the email is now working fine in Opera…tested earlier and had no issues. my only issue is still the AC one having to be logged in prior to uploading attachment. ok Ivan and I will report back later…many thanks. Latest build seems to have fixed the issue I was having when using outlook 2010 x64 and ‘AC’. as far as replying to someone and then adding additional attachments to the email and using AC then everything once again appears to be operating perfectly. If you find anything else, contact us.